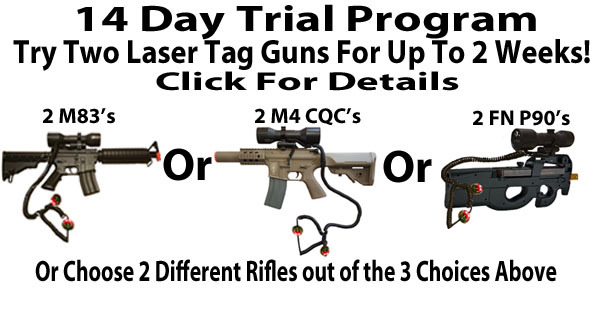 Affordable Laser Tag Equipment - Check Out Our 14 Day Trial Program! Buy 7 Get 1 Free Deal. New FN P90 ABS Rifle. 14 Day Trial - Test Two Guns For 2 Weeks. Start A Business - Click For More Info. 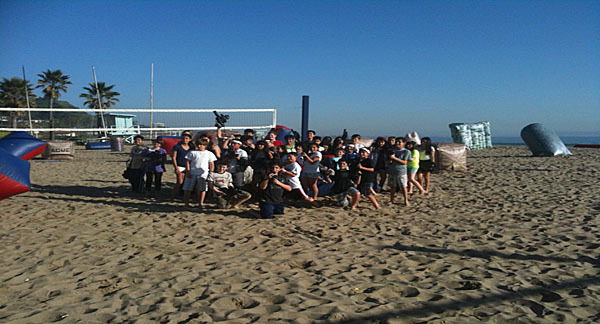 The Ikon-x Laser Tag Guns are always a HIT! 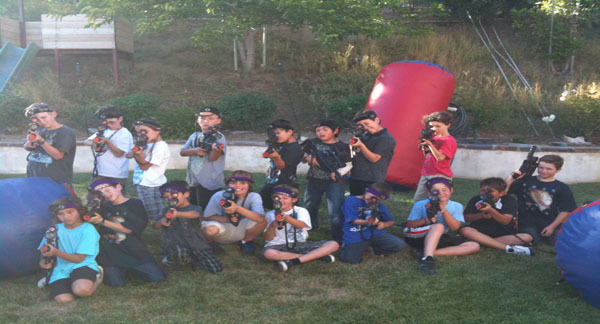 Play Indoors or Outdoors, Day or Night with Ikon-x Laser Tag Guns. Get started. Buy now or contact us today. Start a laser tag business. 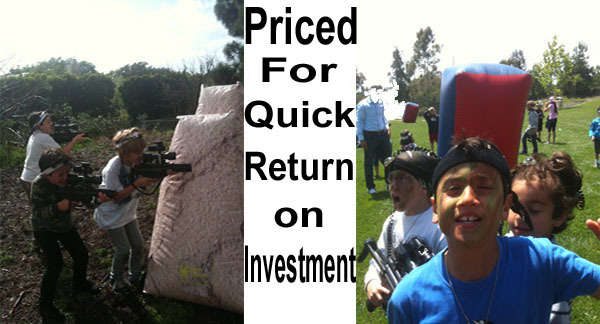 A fast return on investment is one reason why we created this adaptable and affordable outdoor laser tag system. Laser tag equipment that is suited for everyone from the spirited and visionary entrepreneur to the recreational adventure seeker. Whichever category you fall into we believe the Ikon-x will be the right laser tag system for you. 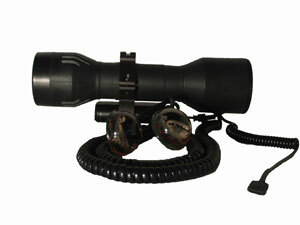 You won't find a more affordable commercial laser tag system on the market. Perfect for a mobile laser tag business. We've put a year and a half of research and development into the Ikon-x, considering everything from the functionality and versatility of each unit, to significant issues such as the weight of the units (very important for younger players), the look and design of the units, and the affordable price of the units. So take your time to look around our website and gather as much information as necessary to see if the Ikon-x is right for you. 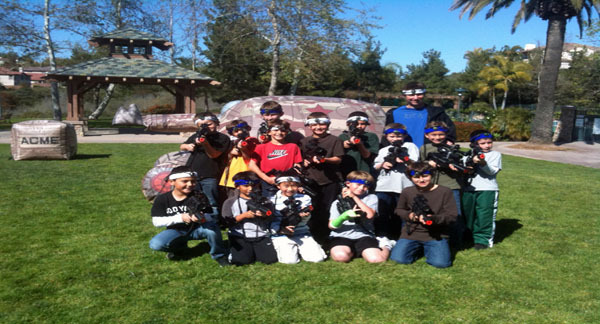 Ikon-x outdoor laser tag equipment is celebrating 13 years in business. With thousands of laser tag guns sold we continue to provide a commercial grade laser tag product at an affordable price by continuing to convert airsoft rifles into outstanding laser tag rifles using our proprietary Ikon-x laser tag device. Familiarize yourself with The Display, The Sounds and The Scoring System on the Ikon-x and The Ikon-x Sensors (sensors light up when hit). Take Advantage of our 14 Day Trial Program. We want you to be totally comfortable with your decision in purchasing the Ikon-x. So much so that we are offering a 14 day money back guarantee program. Purchase two Ikon-x laser tag guns and try them for 14 days. If you are not satisfied with the product, return them for a full refund. Click here for full program details. We created this money back program because we have faith in our products based on years of real world applications. In other words we know our products are good because we use them every day to run our own successful mobile laser tag business where 60% of our business is repeat business or referrals. The Ikon-x laser tag guns are always the stars of the show. Need to order more headbands? Click here. Since our sensors light up with red LED light, we suggest you NOT buy red headbands. The red light blends in with the red headband color making it difficult to notice when the light is on. Need repairs? We're also here to support our current customers with any repair issues. So if you are a customer from way back and have first generation equipment or a more recent customer and have equipment that has fallen out of warranty, rest assured, we can repair, refurbish and even upgrade non light up and limited ammunition equipment to the current system. Current customers click here for repair information. Buy 7 Get 1 Free. We've also extended our popular Buy 7 Get 1 Free deal. 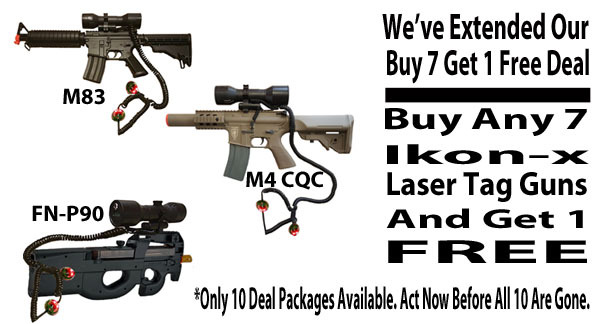 Buy any 7 Ikon-x laser tag rifles and get 1 FREE! There are only up to 10 of these deals available so act now before they're all gone. Click Here to visit the Special Deal page in our store. This is one of our new laser tag rifles and is the replacement for our discontinued flagship MP5 rifle. After 12 years of use we had to retire the reliable MP5 airsoft rifle due to its discontinued status by the UHC manufacturer. This is a full size M83 replica. Highly recommended for both starting a business and for personal use. This model is made of durable ABS plastic and the weight is light enough for younger players, but also possesses the realistic look and feel required by older players. This M83 ABS is a complete set ready to go right out of the box. It comes with the Ikon-x laser tag unit completely attached to the gun and the trigger switch wired inside the gun. The Ikon-x is a powerful laser tag system with a hit range of over 350 feet in broad daylight and a range of over 650 feet at night. 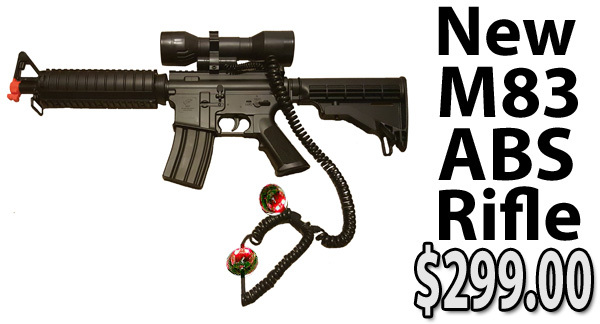 When you make your purchase your package will include the M83 ABS gun, the main laser tag unit, one 7.4 volt (2000 mA) rechargeable battery, one customized scope mount set, one Weaver scope rail, one trigger switch, one key for unit activation and reset, one battery charger (for every one to six units purchased) and a headband. Remember the M83 ABS is also a fully functional airsoft gun as well as a laser tag gun. As an airsoft gun it is an electric rifle or better known as an AEG and is capable of shooting airsoft bb's. The airsoft capabilities are disabled but can be enabled by you. This is one of our most popular guns. Highly recommended for both starting a business and for personal use. This is a full size FN P90 replica. This model is made of durable ABS plastic and the weight is light enough for younger players, but also possesses the realistic look and feel required by older players. This FN P90 is a complete set ready to go right out of the box. It comes with the Ikon-x laser tag unit completely attached to the gun and the trigger switch wired inside the gun. The Ikon-x is a powerful laser tag system with a hit range of over 350 feet in broad daylight and a range of over 650 feet at night. 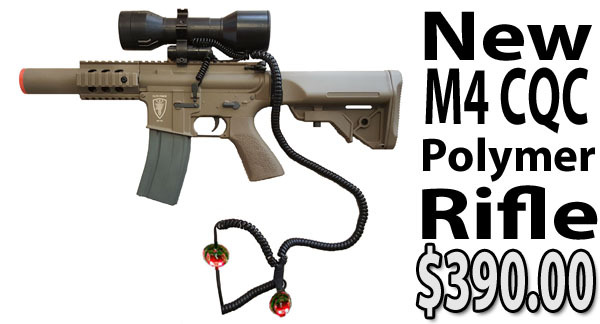 When you make your purchase your package will include the FN P90 gun, the main laser tag unit, one 7.4 volt (2000 mA) rechargeable battery, one customized scope mount set, one Weaver scope rail, one trigger switch, one key for unit activation and reset, one battery charger (for every one to six units purchased) and a headband. 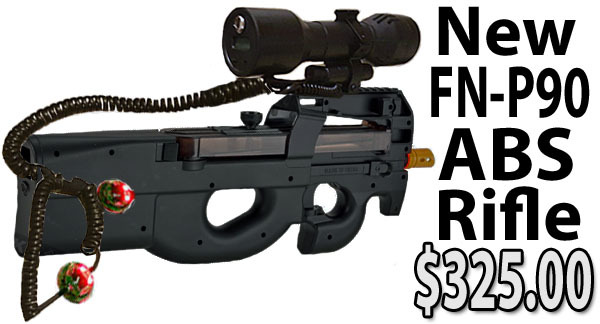 Remember the FN P90 is also a fully functional airsoft gun as well as a laser tag gun. As an airsoft gun it is an electric rifle or better known as an AEG and is capable of shooting airsoft bb's. The airsoft capabilities are disabled but can be enabled by you. This is a great gun. Highly recommended for both starting a business and for personal use. This is a full size M4 CQC replica. This model is made of durable polymer plastic and the main body is tan in color. The weight is light enough for younger players, but is a bit heavier than the ABS models (about a one pound average difference). It also possesses the realistic look and feel required by older players. This M4 CQC is a complete set ready to go right out of the box. It comes with the Ikon-x laser tag unit completely attached to the gun and the trigger switch wired inside the gun. The Ikon-x is a powerful laser tag system with a hit range of over 350 feet in broad daylight and a range of over 650 feet at night. 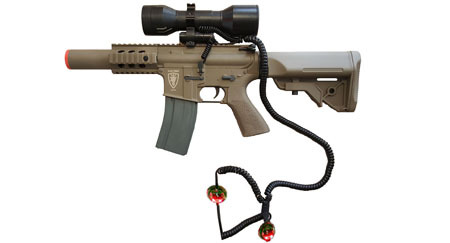 When you make your purchase your package will include the M4 CQC gun, the main laser tag unit, one 7.4 volt (2000 mA) rechargeable battery, one customized scope mount set, one Weaver scope rail, one trigger switch, one key for unit activation and reset, one battery charger (for every one to six units purchased) and a headband. 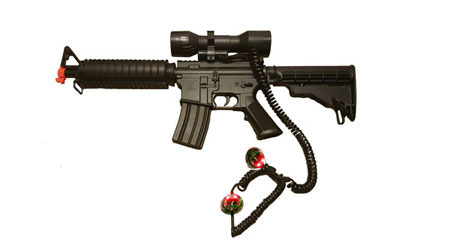 Remember the M4 CQC is also a fully functional airsoft gun as well as a laser tag gun. As an airsoft gun it is an electric rifle or better known as an AEG and is capable of shooting airsoft bb's. The airsoft capabilities are disabled but can be enabled by you. This laser tag device is the Ikon-x main unit and was designed to adapt to any weaver compatable sight rail and is a great solution for those experienced with scope mounting. 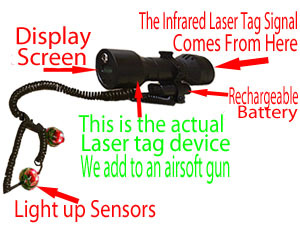 Included in this package are the ikon-x main laser tag unit, one 7.2 volt rechargeable battery, one customized scope mount set, one trigger switch, one key for unit activatation and reset, one battery charger (for every one to six units purchased) and a velcro headband. The main unit is constructed from ABS plastic for both durability and light weightedness. Weaver sight rail is not included because the type of rail you need depends on the type of airsoft gun you have. This is a full size hand gun pistol replica with a removable magazine. This model is made of alloy metal. This pistol is a complete laser tag gun ready to go right out of the box. 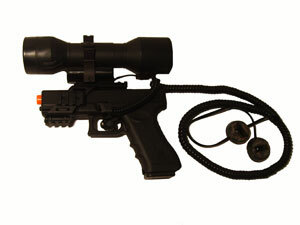 It comes with the Ikon-x laser tag unit completely attached to the gun and the trigger switch wired outside the gun. The Ikon-x is a powerful laser tag system with a hit range of over 350 feet in broad daylight and a range of over 650 feet at night. When you make your purchase your package will include the pistol, the Ikon-x main laser tag device, one 7.4 volt (2000 mA) rechargeable battery, one customized scope mount set, one Weaver scope rail, one trigger switch, one key for unit activation and reset, one battery charger (for every one to six units purchased) and a headband. Remember the pistol is also a fully functional airsoft gun as well as a laser tag gun. The referee gun is made to reset your players faster. This is a full size pistol replica. This model is made of alloy. This pistol is a complete referee gun ready to go right out of the box. It comes with the Ikon-x laser tag unit completely attached to the pistol. 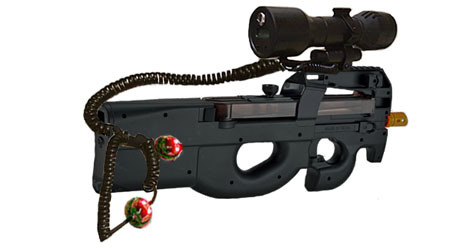 This unit is a functional laser tag gun except it can not receive hits. This unit DOES NOT come with sensors. The unit can be programmed to reset other units that have sensors without constantly using the key. Purchasing one or two of these units for your referees will help control the flow of the games better. 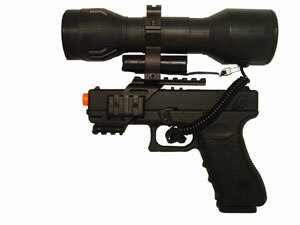 To make this a fully functional laser tag gun we can easily add sensors to it for an additional $30.00 per unit. When you make your purchase your package will include the pistol gun, the main Ikon-x laser tag unit, one 7.4 volt (2000 mA) rechargeable battery, one customized scope mount set, one Weaver scope rail and one key for unit activation and reset. Remember the pistol is also a fully functional airsoft gun as well as a laser tag gun.